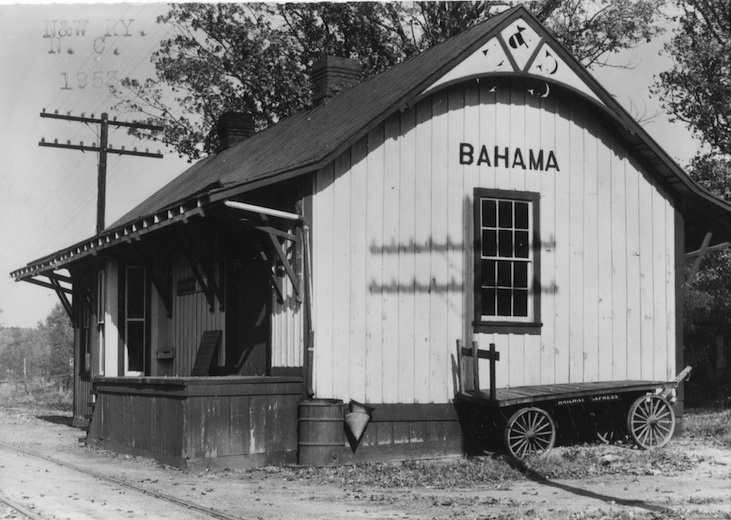 Durham County: Bahama (Lynchburg and Durham Railway/Norfolk and Western Railway), circa November 15, 1953; P0073/0073_0021, in the North Carolina Railroad Station Photograph Collection (P0073), North Carolina Collection Photographic Archives, University of North Carolina at Chapel Hill. Abstract The collection consists of 66 images of North Carolina railroad stations. Images depict railroad stations in over 40 counties in North Carolina and consists of photographic prints made from images taken by unidentified photographers. Materials are arranged by location, and many descriptions include the name of the railroad company that owned or managed the stations. [Identification of item], in the North Carolina Railroad Station Photograph Collection (P0073), North Carolina Collection Photographic Archives, The Wilson Library, University of North Carolina at Chapel Hill. Until 2011, the materials in this collection were part of the North Carolina County Photographic Collection (P0001). The materials were originally purchased from Louis Ginsburg of Petersburg, Va., in 1988. Seaboard Air Line Railroad Company--Photographs. The North Carolina Railroad Station Photograph Collection consists of 66 images of North Carolina railroad stations. Images depict railroad stations in over 40 counties in North Carolina and consists of photographic prints made from images taken by unidentified photographers. Materials are arranged by location, and many descriptions include the name of the railroad company that owned or managed the stations. Expand/collapse North Carolina Railroad Station Photograph Collection, circa 1896-1977. Back of image reads: "Was first Boone Station. The Mill Point. First station circa 1887, before College was built." Back of image reads: "New station after former sta. was torn down after partial demolishing by freight train derailment." Back of image reads: "Removed in 1975, No. Carolina RR opened to here from Raleigh in spring of 1855. In Jan. 1856 line completed to Greensboro." Back of image reads: "Old passenger station gone." Image reads: "W-S Southbound railway station." Back of image reads: "About 1958, Part of this station now (1964) moved acrsss street as present station." Back of image reads: "Not whole of original station, part of end was cut away." Back of image reads: "May be original station of the Carolina and Northwest before station of Other Railway was built. Line on left is the one to Salisbury." Back of image reads: "Ready to be moved away Sept. 22, 1973"
Back of image reads: "From Norfolk Southern track, has red tin roof, agency close Sept 1972." Back of image reads: "Probably formerly passenger station also torn down about 1968 replaced by small front office." Back of image reads: "Ex. N.S. ?, Havelock N.C. A+EC (Now)"
Back of image reads: "Probably used to be the joint station with Va. and Carolina Southern." Back of image reads: "Gone-1970"
Back of image reads: "Brick station, High platform (stone), Passing trains stopped at ends of station-not opposite"
Back of image reads: "L+D in eaves originally Lynchburg + Railroad"
Back of image reads: "East Carolina Railroad abandoned about 1967, station now police station"
Back of image reads: "May be changed since passenger service"
Back of image reads: "SCL (Ex SAL -Seaboard Air Line), Stanley N.C. (West of Charlotte) by R.L. Drake March 1974"
Back of image reads: "Moved back from track about 50 feet. 22 miles south of Suffolk Va."
Back of image reads: "Waiting room has been removed since passenger service discontinued"
Back of image reads: "Atlantic Coast Line Station Halifax N.C. Halifax N.C. 8-62 N-1338." Back of image reads: "Formerly there was separate passenger station. This freight house was used by passengers until May or June 1968 when trains 17 and 18 were taken off. Wooden (?) in building probably first station about 1855, by Raleigh and Gaston Railroad." Back of image reads: "This is the Atlantic Coast Line Railroad station at Palmyra, North Carolina, in Halifax County, in 1923. I was agent there from February 1920 to mid 1924. The picture was taken from the south and the door in the end is to the colored waiting room. The front entry is to the white waiting room and then to the office. Palmyra was then a thriving cotton, peanut, and spud farming section...(rest is illegible)- E.J. Sutherlin, February 1967." Back of image reads: "Formerly Union Station"
Back of images read: On Norfolk Southern Station "On branch Varina to Fayetteville" and Atlantic and Western Station "A and W abandoned from Jonesboro east. Was running Sanford to Lillington in 1959"
Back of image reads: "Robert in cab of 205." Back of image reads: "Line abandoned east of Jonesboro." Back of image reads: "This line in 1935 was part of Norfolk Southern Railroad." Back of image reads: "11 miles west of Plymouth." Back of image reads: "New passenger section added to freight train in 1953." Back of image reads: "30257: Monument at right in commemeration of Old Fort which was near. Helper engine returned from pushing train up ridgecrest; 30304: Southern Train #16 Diesel 4134 West-High-Fill with 13 coaches." Back of image reads: "May not be original passenger station. In 1931 had passenger train. 9:43 AM West, 7:02 east (Richard and Jim in picture)"
Back of image reads: "Village voting place is in station. Post Office on right (station torn down 1972)"
Back of image reads: "(In George Village)"
Back of image reads: "N and W. Letters L and D (Lynchburg and Durham) in peak of roof. Probably original station." Image includes diesel 203; Back of image reads: "Ex. HPT+D 202 owned now by Superior Stone Co. Idle here for a year. Only former East Carolina R.R. tracks left is from Fountain to Farmville." Back of image reads: "Station same as when passenger trains ran except (illegible) over recently. Showing Mr. F.L. Pressnell." Back of image reads: "Connects with Southern Air Lines at Alma." Back of image reads: "Torn down about 1969." Back of image reads: "(Only bus service in 1935) Operated by Yadkin Coach Company." Back of image reads: "Probably changed since passenger service. In 1935 was Yadkin RR (run by Southern) only bus service." Back of image reads: "Last passenger train 1937. Stone pass. (enger) sta. (tion) with wide stone steps." Back of image reads: "This was probably never used as Passenger station. Now freight Service. Possibly part of original station." Back of image reads: "Richmond and Danville train Jarrett's N.C. 1896 (according to R.B. Carneal)." Back of image reads: "Durham and Southern diesel 1200." Back of image reads: "Norfolk Southern engine 1615. RR to be taken over by Southern Railway January 1, 1974. This station is in Varina. Fuquay Springs station gone for about 15 years." Back of image reads: "Built 1964 or 1964 (air-conditioning)."